I am ready to start the lace portion of this shawl that is a super secret holiday knit. I love keeping secrets and so far I love knitting this shawl. Yesterday I cast on three other projects and I posted about them here. I am back to having four projects which is the ideal number for me. I think my knitting bag gets lonely when there is just one. Ha! Can you believe I have a different book this week? Yes, I finished Little Women and reading it a second time was just as good as the first time around if my memory is right. So I haven't much to say about my new book The Secret Keeper by Kate Morton since I've only started last night. I'm sure this book will take me a few weeks to read as well. Karen, the yarn for the shawl is absolutely beautiful. I can imagine how soft the yarn must be just from seeing the picture. I want you to know that you inspire me! I crochet rather than knit and had pretty much given up the idea of doing any crocheted gifts for Christmas this year. But after seeing all of your lovely work I looked up some patterns the other day and will be purchasing some yarn tomorrow so I can get started! Thanks so much! I'm anxious to get some Christmas knitting done. As soon as I get this sweater done I'm making my list and starting. Did you make that project bag? It's so pretty! And as always - your yarn is gorgeous. We have to keep our knitting bags from getting lonely! I'm better with one at a time, but had to cast on a second take-along project that didn't require counting. That yarn looks lovely; I can't tell if it's purple, gray or both, but it is stunning. I haven't read any Kate Morton yet, but have The Forgotten Garden and The House at Riverton, so I'll be glad to hear your thoughts. Happy secret knitting! I love Little Women, I always wanted to be Jo. I'm knitting for Christmas already. I'd like to make something for several people, but probably need to be more realistic. I don't knit very fast, and I can't spend ALL my time knitting, much as I would like to sometimes. Oh, super secret Christmas knitting is so much fun! I am just about finished listening to The Secret Keeper on my ipod and I must say it is one of the best books, I love it! If your Kate Morton is anything like the other ones, it'll be great! I love the secret project... Hoping you will be able to share it someday! I love your shawl colorway- in fact I'm almost certain I have socks in that same yarn! Kollage? Pretty project bag too! I love the colors in your yarn! That book is definitely on my list. I enjoyed The Forgotten Garden. beautiful yarn! I'm not sure I'll get around to knitting for Christmas this year. Right now I just can't be bothered. Do let us know how the book its. I like the cover of it. Your yarn looks beautiful. looking forward to seeing how the shawl comes out. 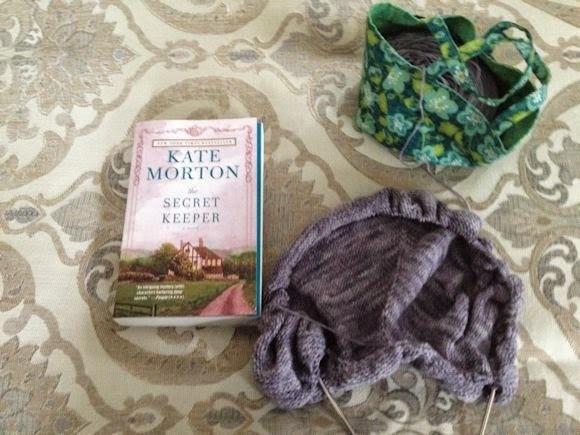 The Secret Keeper I enjoyed - I've read a few books now by Kate Morton - worth reading her other ones if you enjoy this one. Yay! Beautiful yarn! I am in the middle and yet the beginning of Christmas knits too! I just started Christmas knitting as well.... but I keep getting distracted with other projects! I need to get a move on with my holiday knitting but there are so many things I want to knit for myself ~ oh, to be selfish! Like you I've started some socks too and am still loving the reluctant tourist and savouring the pages. Enjoy all your lovely projects. I love how the book cover and yarn compliment each other! The beginning of this October has all the knitters I know in an excited state. Happy Knitting. That's such a pretty color on the shawl. I didn't know Kate Morton had a new book; thanks for the info! Beautiful yarn and such a yummy color! I love Kate Morton's books and this one is a fav. Such a pretty shawl, Karen! I wonder who the lucky recipient will be??? Guess we'll have to wait for a couple of months to see :) Love the knitting frenzy you've got going on! You are making me pine after Little Women, after so many years! Your photo is very pretty, and the shawl, beautiful.